The SaniDry Sedona removes more water for the same electricity cost as standard dehumidifiers. SaniDry dehumidifiers and filtration systems dry and filter the air in your basement or crawl space, reducing moisture and eliminating mold and musty odors. The SaniDry Sedona and SaniDry XP models are not only ENERGY STAR certified, but they remove more water from the air than a standard dehumidifier, yet use the same energy. Dr. Energy Saver is an exclusive dealer of SaniDry dehumidifiers. Call 1-888-914-4171 or click below to schedule a consultation and estimate with your local installer. 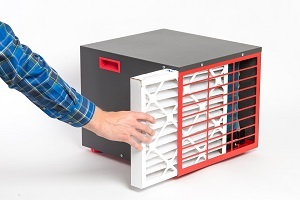 A MERV 8 filter removes mold spores, dust mites, dust mite droppings from your air. The SaniDry Sedona removes over 95 pints of water from the per day, and moves over 300 cubic feet of dry air per minute around the basement or crawl space. This dries the building materials and contents in your basement, getting rid of musty odors. The Sedona removes 2.9 liters of water per kilowatt hour. This means you can save on electricity costs while maintaining a dry, healthy and comfortable home. 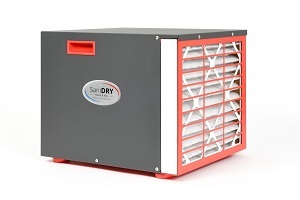 The SaniDry XP will dry the air and automatically drain the water. The SaniDry XP is a powerful dehumidifier that outperforms standard household dehumidifiers by as much as 10 times at 65°, while using the amount of energy to run. The SaniDry XP can remove 109 pints of water from the air per day and circulates 300 cubic feet of dry air per minute. Contact Dr. Energy Saver to learn how you can achieve a more comfortable, healthy home today with a SaniDry dehumidifier and other humidity control solutions. Our products are installed by trained, experienced specialists, so you can be sure you're getting a comprehensive solution for your home.